Micah:6:8: He (God) has showed you, O man, what is good. And what does the LORD require of you? 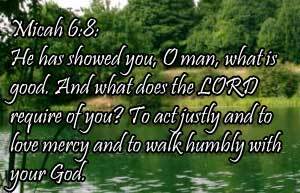 To act justly and to love mercy and to walk humbly with your God. God's Love for humanity and desires for us is not hard to discern. Lord wants to bless us with the gift of salvation. But salvation from sin and death are not something God wants to happen in our lives just once. Jesus this incredible gift of his Son is powerful testimony to this truth. He wants our lives to daily reflect his act of salvation and to share this with others. When we act justly, pursue mercy in our relationships with others, and honor God with our devotions from a humble heart, then we are answering to His salvation as he wants to be. Heavenly Father, our compassionate Lord, as we experience the dept of God Salvation for us, help our eyes to see what your heart sees. Teach us to hate evil and to be merciful to all who need mercy. Teach us to know truth and act fairly, while hating abuse and exploitation. Through your Holy Spirit, stir us to reflect and shine on the great distance between your Holy Majesty and our humble heart. Make us wholly your children, we pray, in Infant Jesus’ name. Amen.